Developer David Jaindl appeared before the East Allen Board of Supervisors during the board’s May 9 workshop meeting to discuss changes to Seemsville Road and Franks Corner as part of the Route 329 improvement project to accommodate his team’s Allen Township warehouse development. Ann Marie Vigilante, Jaindl’s traffic consultant, presented plans for moving Seemsville Road and its intersection with Route 329 into East Allen Township. This plan, which featured input from PennDOT, would be “more safe and efficient” according to Vigilante. The new intersection would be fully signaled with ADA facilities. It would also feature left and right turn lanes to accommodate traffic, not only from Jaindl’s warehouse development, but also from any proposed future development by the Northampton Area School District. The section of existing Seemsville Road could potentially be turned into a cul-de-sac. 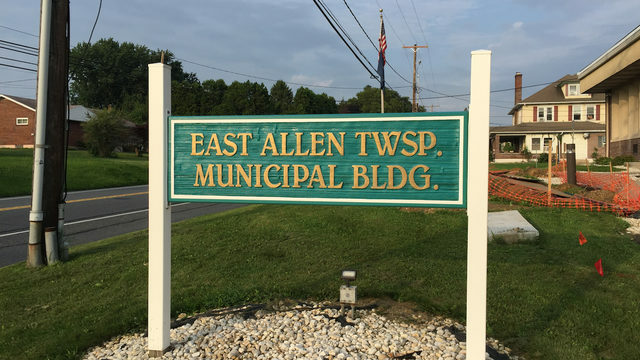 Meanwhile, Vigilante also discussed other improvement plans in East Allen Township, including flashing lights at the East Allen Township ambulance building to make it easier for emergency vehicles to enter onto Route 329. Further east, at the area known as Franks Corner (Route 329 and Airport Road), Vigilante showed plans for more improvements in conjunction with construction being completed by Vertek. “We felt that, if we could enhance [the road], we would like to try to,” she said. Proposed enhancements to Franks Corner include extending the east-bound right-turn lane to 400 feet and adding a “Red Signal Ahead” sign to give drivers a chance to slow down before the intersection. These enhancements are intended to help Route 329 handle the over 4,000 vehicle trips per day caused by the new Jaindl development. Over 1,500 trips will be from trucks, while over 2,500 trips will be from cars. Supervisor Roger Unangst asked Jaindl why he did not approach Allen Township and ask them to upgrade intersections in their own municipality. “What happens in Allen should stay in Allen, but it is not,” he said. However, East Allen residents applauded Unangst for speaking up.